Avoid voiding your warranty when you connect a new speaker to your vehicle. With a Harmony Audio Vehicle Specific Harness, not only will your warranty be intact but your speaker connection would be flawless too! 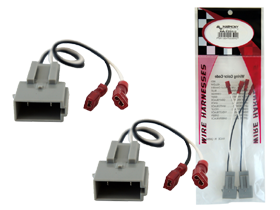 These harnesses can be simply plugged into the factory side of the vehicle's harness then your speakers would be ready to install. Grab one here now!